He made no mention of any alterations being done to the image still in his posts. He obviously rotated it, but failed to point out that fact. So his time for the video grab (00:04 GMT, July 17) is not within the actual timestamped period of the video (01:15 to 01:30 GMT, July 17). The time he indicates is over one hour before the actual start time of the filming. I assumed that the video grab was unaltered and thus the Earth orientation meant it was taken from the second segment., which shows Earth in this orientation. And I don't know why he also put in an incorrect time for it. So, you saw an Earth that looked completely different from where you thought it was taken from but exactly the same as an image from earlier and you assumed that Count Zero was trying to mislead you? You placed more emphasis on the orientation than the cloud pattern? Good grief. As to the time stamp, that's an interesting point. I've looked around and every source I can find says that first TV transmission came at 10.32GET to 10.48GET, which is 00.04GMT-00.18GMT. The only one that doesn't is the caption on that video. Assuming that the caption was indeed made by NASA, I put that down to an error by whoever made the caption slide. Such things do happen. Probably converted to British Summer Time instead of GMT. Possibly, but it's still ten minutes or so out even if that were the case. He complains that I rotating the image without telling him. This from the guy who still hasn't acknowleged that he changed comparison images between posts #19 and 21. For those who can't keep up, the other two video images, the three Hasselblad images and the weather maps were all oriented north-side up. For ease of comparison, it made sense to rotate the first image to conform with the rest. Either that or he converted from Eastern Standard Time to GMT, instead of Eastern Daylight Time to GMT. The US did not standardize Daylight Savings Time until just three years earlier. Now then, turbonium, are you going to tell us about your images of Earth recorded more than 10 hours before Apollo 11 left the pad? 3) They appear to be consistent with recorded weather patterns at the time. If all three points are true, then it seems clear that, at the very least, NASA's claim to have sent men around the moon is true (sure you might still argue that they didn't actually land on it), and that that part of the debate can be closed off for good, no ? 2) checking whether the apparent position of the camera relative to the earth is consistent with where the moon should have been at the time, or consistent with the claimed route to the moon. Sorry - I don't have the skills to do this myself. 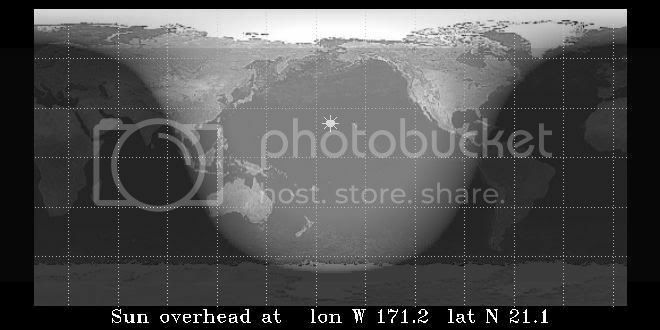 Here is one web page that can display Day and Night Across the Earth for a specified date/time for comparison against the images. Well since they would have been ahead of the where the moon was, it's hard to get an exact match, but it looks pretty darn close to me. This would be easy to do using this site. For best results, I need the latitude, longitude and altitude of the spacecraft at the specified times. Does anyone know where I can find this data? Are you claiming that rotation of the image is a serious anomaly? But assuming we can rely on it . . . . I used it to produce the view on 17th July 1969, at 23:31 UT. We can't be absolutely certain, but the position of the terminator certainly appears to be consistent with the photograph - i.e. all of the continental USA and most of the Pacific are in sunlight, South America is in darkness. Note that this is not exactly the same as the photo, but I'm guessing that this is because the route taken to the moon diverged somewhat from a straight line - I'm sure this is checkable. This doesn't actually prove that NASA went to the Moon - after all, if NASA had faked it, they would presumably have got this detail right, you'd think. But it is yet another demonstration of the massive internal consistency of NASA's claims. Turbonium - you seem to have gone quiet on this one. If you're still thinking about this, can you let us know ? Otherwise, you must either accept Count Zero's analysis and therefore accept that NASA sent men a long way towards the Moon, OR you must dispute some specific part of his analysis - in which case, which part ? Also, the space craft was traveling to where the moon would be when they got there -- leading the target, in a big way. So the moon was indeed not in a straight line with Apollo and the Earth. I grabbed one based on the link Count posted (a non-government link) and used the the assumption that they flew a basically straight line from the Earth to where the moon would be at intercept (again not true, it was a conical cuve resembling a sort of elongated "S".) The result is extremely close to the photo. Not exact, but that is due to the assumptions on positioning. You can tell that the real position would have been to the west of what I have. I was going to post it last night but got distracted by Morrowind. Might try tonight. 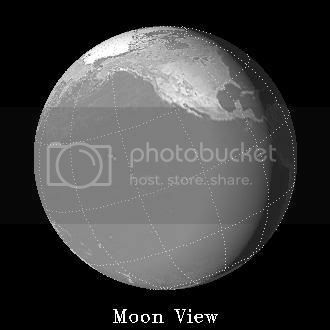 If you need a non-US site, Fourmilab Switzerland has, amongst other stuff, a Earth and Moon Viewer page, which references their own map of the Earth, which will generate images of the same sort as the other link I gave.